(CNN) -- In May, CNN's Living Golf revisits one of the best episodes from 2008 -- our special on Germany's leading golfer, 24 year old Martin Kaymer. 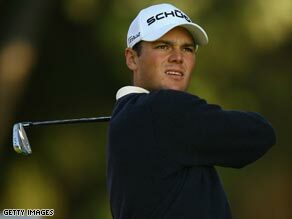 2007 Rookie of the Year Martin Kaymer tells CNN's Living Golf about his early professional highs and lows. We also meet the players doing their bit to raise Portugal's profile on the tour, and look at the role the mind has to play in a good game of golf. Double major champion Bernhard Langer put Germany on the golfing map throughout the 1980s and 1990s, but since the turn of the century the country has been crying out for a replacement. After claiming the 2007 European Tour "Rookie of the Year" award, Martin Kaymer may very well be the answer. Having won twice on the European Tour in 2008, along with two second place finishes, Kaymer just missed out on last year's Ryder Cup, ending up as the first reserve. On this edition of Living Golf, Kaymer invites CNN back to his home town of Dusseldorf where he tells us about his plans for the future. Our touring professional Adam Scott will be explaining how to cure that dreaded slice and how to shape the ball. When it comes to playing good golf any number of top players will tell you the game is 95 percent in the mind, and the rest of it is taken care of by the body. This is especially true of a professional whose mind can often buckle under the pressure of playing in a tournament. It therefore seems odd that amateurs spend so much time learning to swing the club, and paying large amounts of money for lessons, but very little time on training the mind to play golf. Now researchers Pro Golf IQ believe they have found a way to train the mind to play the game -- or is it just another gimmick? Justin Armsden investigates. Portugal has long been established as a leading golfing destination in Europe but it has yet to be represented by a familiar face on the professional tours. CNN's Pedro Pinto joins the European Tour in Vilamoura for the Portugal Masters to speak with some of the leading names in the game, including Jose-Filipe Lima and Ricardo Santos. We'll also be hearing from 2008 European Ryder Cup captain Nick Faldo, who has designed one of the newest courses in the Algarve.